In 1972 James Herriot wrote a book called All Creatures Great and Small, a fantastic story of his life as a veterinarian. I make no claim to be the caliber of writer of Mr. Herriot, but I do have some fun and interesting stories to tell. And one, while not the first in chronological order, is very similar to the first story in his book, so let�s start there. One of the first cases for my practice was a house call, which predictably came on an unusually rainy, windy and generally miserable August night, a little after ten. 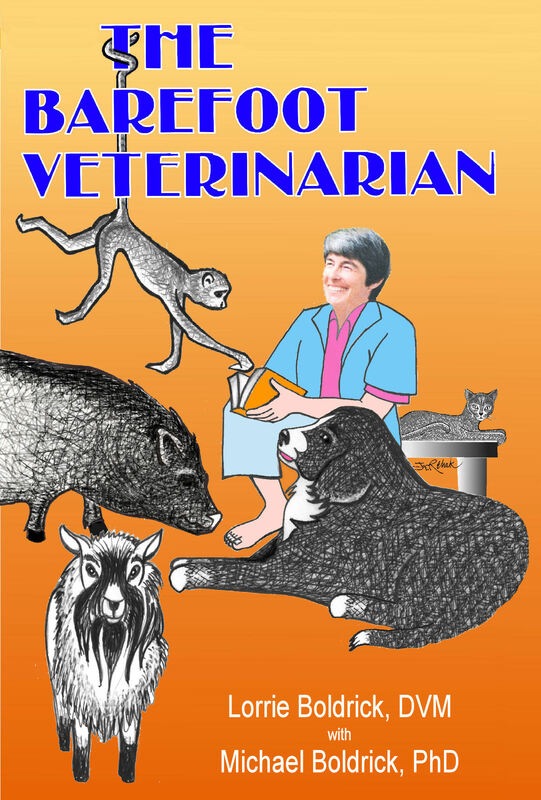 A goat had been attacked by a pack of neighborhood dogs and injured badly � severely enough that his owners, Anne and Bill Rodgers, were afraid to load him into their truck for the forty-five-minute drive to my clinic. Rather than have me go on the house call alone, my husband Tom said he and two-month-old Allie would come along to keep me company. Shiloh, my patient, was a large, statuesque Alpine wether, dark brown with three white stockings, white around his nose and both eyes and a white behind. He was in shock, so his brown eyes seemed overly large, yet unfocused. Both of Shiloh�s back legs had been chewed extensively, exposing flesh and muscle all the way up to his hips. He couldn�t stand up, but the damage did not appear irreparable. Anne and Bill had already laid him on a blue-plastic tarp in a vacant horse stall, providing me with a relatively clean environment and plenty of room to treat poor Shiloh. Anne sat beside him, petting and comforting him, trying to keep him still. Bill helped me fetch my instruments from the van and then joined Anne in restraining Shiloh as I assessed the damage. After my initial examination, I gave Shiloh an injection of antibiotics and began the long process of cleaning and suturing wounds. After nearly two hours of steady work, I finished all I could do that night and made arrangements to come back the next day to check on Shiloh. As we were driving home, Tom commented, �That call was just like the first chapter of All Creatures Great and Small.� We had both recently read the book and in the first chapter, while the young veterinarian is struggling to deliver a calf, an old farmer sits in the back of the barn maintaining a constant commentary of how his vet, Mr. Broomfield, would have done everything differently and certainly would have pulled the calf and finished already. Perhaps the Rodgers� neighbor had read the book, too? The erstwhile �expert� neighbor was never there for any of my follow-up visits, but I assume he was as pleased with Shiloh�s progress as everyone else. And I am happy to report that after six weeks of nursing and physical therapy by his owners Shiloh recovered very nicely and my private practice was off to a successful start.